Seventeen-year-old Pru Palmer lives with her twin sisters, Grace and Blythe, and their father, Rick, on the outskirts of an isolated mining community. The Palmers are doomsday preppers. They have a bunker filled with non-perishable food and a year’s worth of water. It doesn’t take long for everything to unravel. In town, supplies run out and people get desperate. The sisters decide to keep their bunker a secret. The world is different; the rules are different. Survival is everything, and family comes first. 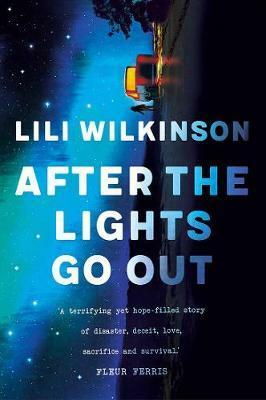 Lili Wilkinson’s latest novel is a page-turning thriller set in a post-disaster world. Pru’s single father is a doomsday prepper – which means he has a hidden bunker with supplies to last for years and he makes his three daughters do regular drills, practising for the apocalypse. When a solar flare triggers a shutdown of all power and electronics, Pru’s father is away at work on the mines hundreds of miles away and she must take charge of her two younger siblings. Pru also provides a helping hand to Puerto Rican American Mateo, a newbie in town who is all alone while his mum is also working at the mines. After the lights go out, the community must learn to band together and help one another to survive. Pru and Mateo quickly become romantically involved but will Pru tell anyone about her family bunker filled with supplies or keep quiet and watch people suffer? And what has happened to Pru’s father? This is an action-packed, realistic thriller that is fascinating to read and had me thinking about brushing up on my survival skills. Each character is beautifully drawn and there are some fantastic, diverse secondary characters, including Peter Wu, the Shakespeare-loving local preacher, and Violet Gumbuna, an elder and authority figure. Lili Wilkinson’s writing is on fire and this story will appeal to a broad range of readers aged 14+.